A good detective must be able to gather lots of information from simple stories around the city. Many times, math plays an important part in information gathering. 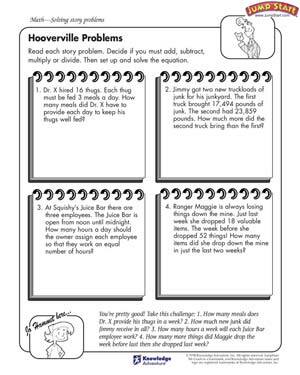 Can your fifth grader use basic mathematical operations to answer the questions following four stories from around Hooverville? If she’s up for the challenge, let her try and answer kid detective Jo Hammet’s additional questions too.